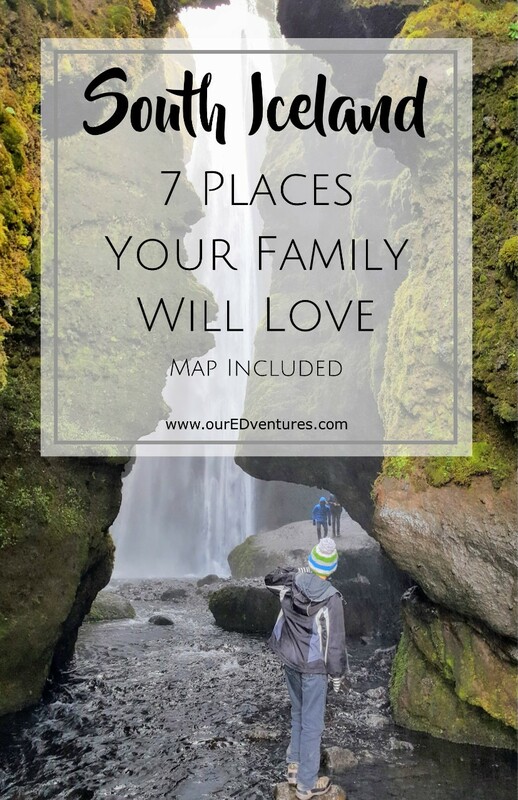 7 Places Your Family Will Love! Iceland was one of those places that captured our imagination. We had seen so many stunning pictures from other travelers and wondered if the opportunity would one day arrive for us to visit. Well, it came sooner than we expected. On a day in late September, a flight sale from WOW Airlines arrived in my inbox that was too good to pass up. Within minutes we had purchased tickets and would be heading to this rugged island nation just a few weeks later. We are a family of four that almost always travels together, but for this one, we were changing it up a bit. My husband was too busy with work for this last-minute trip, and so while he opted to stay home (which I think he now regrets), two friends came along with us making it a complete group of five – two moms and three boys. 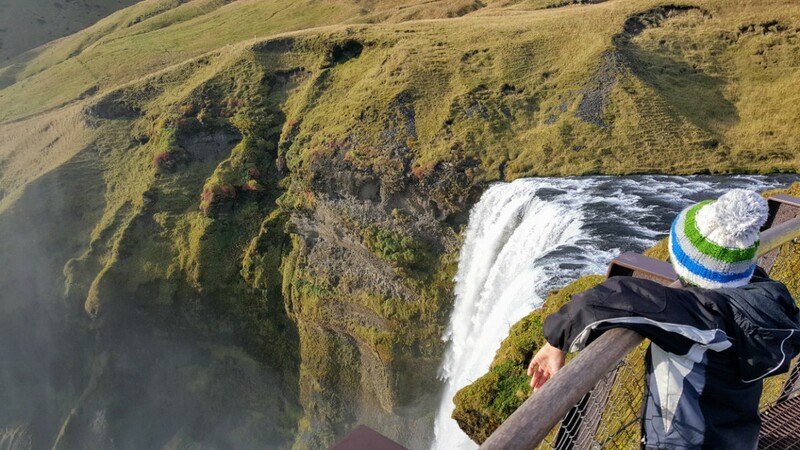 Our trip lasted a week, and instead of trying to squeeze everything into one enormous post, I’ve decided to divide our Iceland posts up according to region. 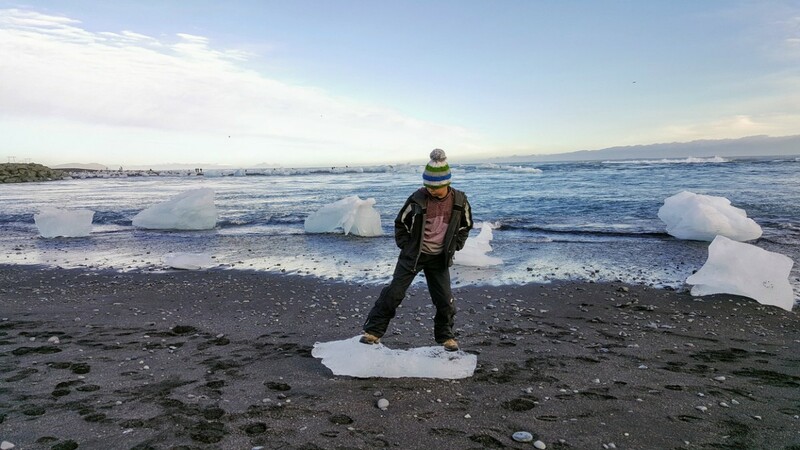 I’ve already posted about our experience in Reykjavik, West Iceland, and the Snæfellsnes Peninsula and now here is our South Iceland post. 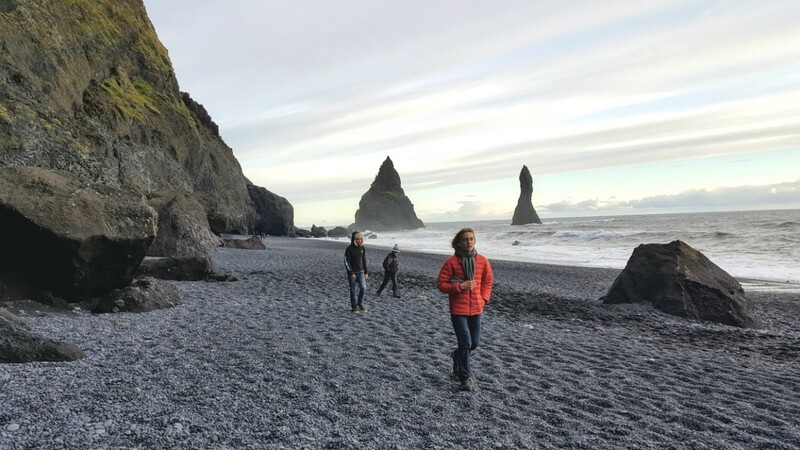 Keep reading to find out what seven places we loved in South Iceland. If your family is anything like mine and has a great love for animals, you must add visiting a horse farm to your itinerary. 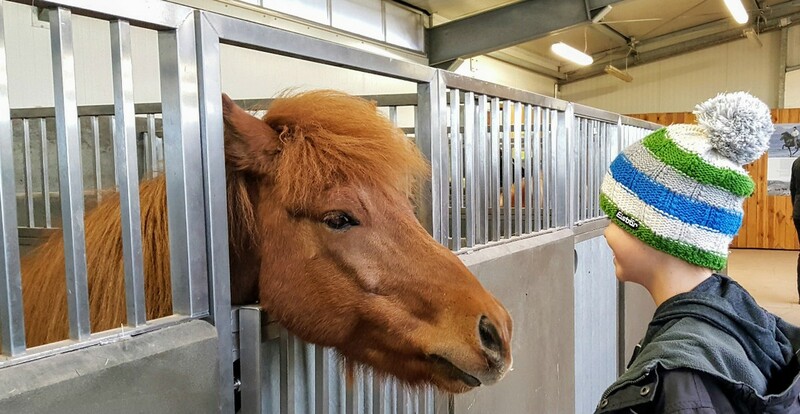 South Iceland has lots of horse farms to choose from. 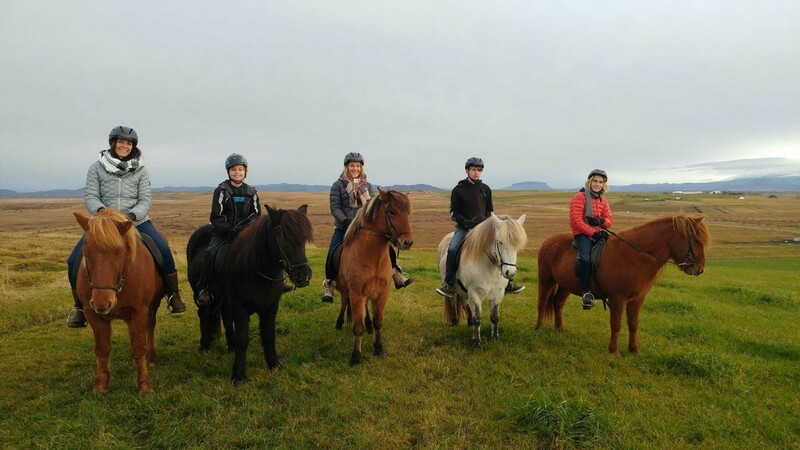 We did some searching around on Tripadvisor before leaving home and chose Icelandic HorseWorld located in Skeidvellir because of their excellent reviews. We were pleased with this choice. They are located just over an hour from Reykjavik and only a few minutes from the ring road. Communicating with Katrin, the owner, through email prior to our visit was easy. 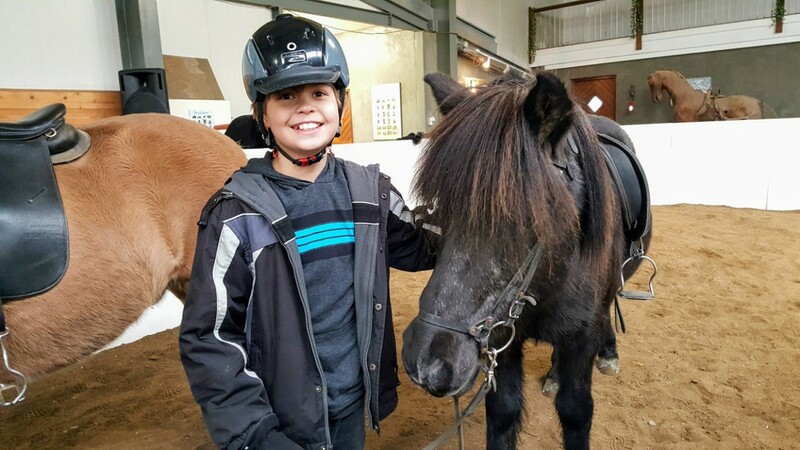 We began with an educational tour, learning about the history of the Icelandic horses dating all the way back to Viking days. 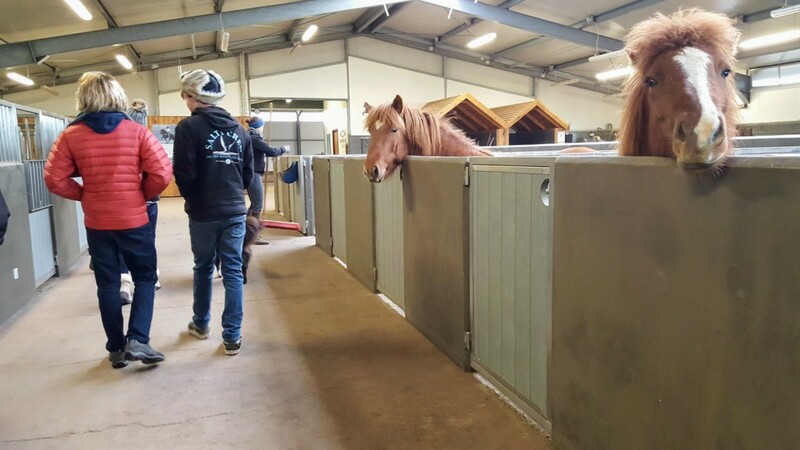 Icelandic Horseworld has a friendly international staff who introduced us to each of the horses as we made our way through their beautiful state-of-the-art barn. Then we walked over to the riding arena where we got a demonstration of the Icelandic horse’s unique gait, called a tolt. Finally, it was time to ride! What we didn’t realize at that time, was that from the moment our group arrived, they had been carefully listening to us and sizing us up for the best riding experience. When the time came, they matched each of us up to a specific horse based on our size, experience and comfort level. They made a perfect match! We each loved our horse and felt entirely comfortable. We took a ride in the surrounding countryside near the farm and then ended in an outdoor arena where we each had a chance to try the tolt. It was thrilling to go faster and yet surprisingly smooth. 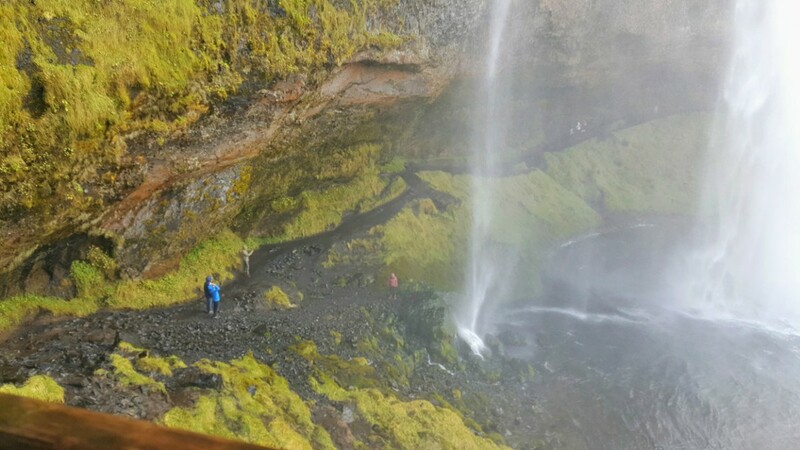 These two waterfalls are both accessed from the same parking lot, and both offer something unique. 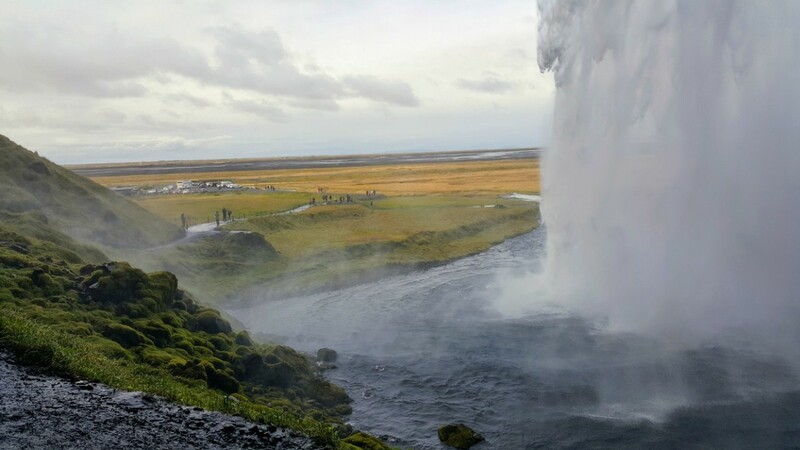 With Seljalandsfoss, you can follow the trail and walk all the way behind the waterfall. We debated on whether we wanted to do this or not. When we saw some tourists with full rain gear, we felt inadequately prepared and with a full day of sightseeing still ahead of us; we weren’t sure getting drenched was a good idea. But we went for it and were glad we did because seeing the backside of a waterfall isn't something you get to do every day. From behind...Just a short walk away; you’ll find Gljufrabuli. 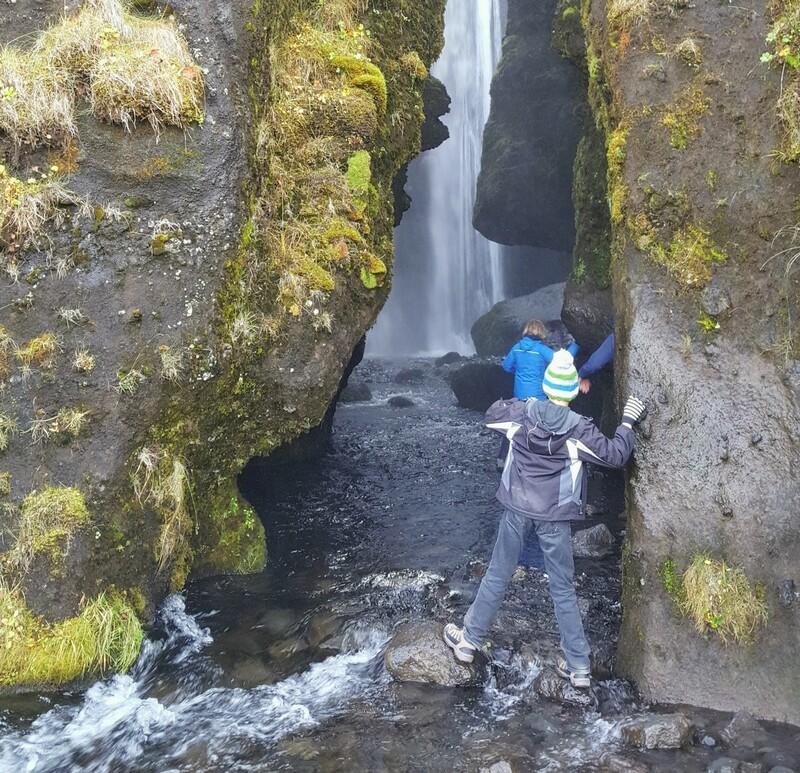 My boys loved exploring this spot because it’s a hidden waterfall in a small canyon. 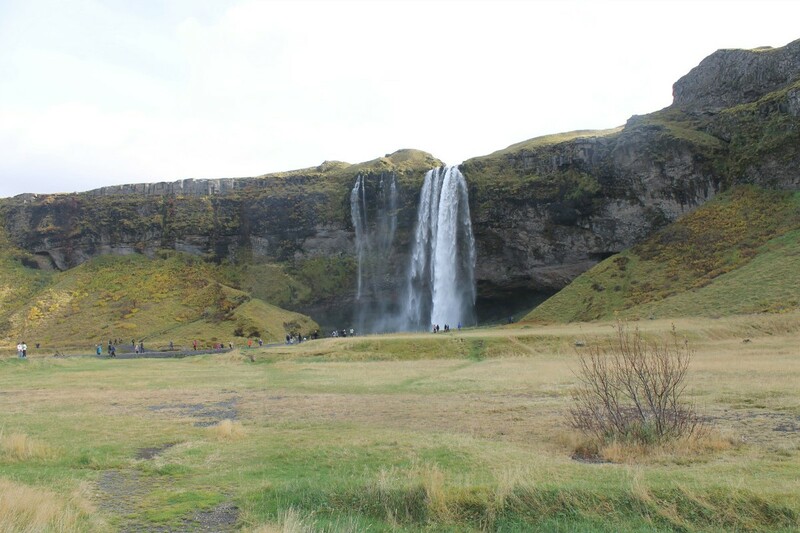 Located right off of the ring road between Seljalandsfoss and Skogafoss, you’ll see the old turf houses of Drangshild. Collections are currently being taken to restore these old houses and entering them is strictly prohibited as they are not stable. But it was so interesting to take a few minutes, see them up close and imagine what life might have been like for the people who made their homes here. 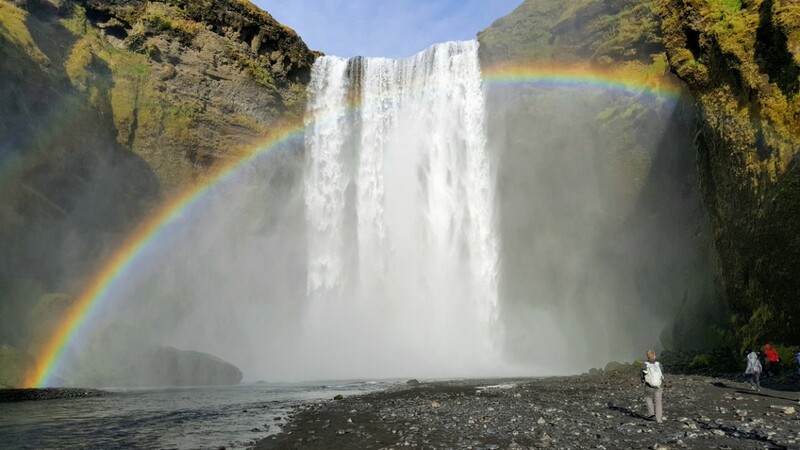 We thought we were as lucky as leprechauns to catch this rainbow at Skogafoss, but it turns out that rainbows here are quite common because of the large spray of water that is continually present at the base. Two glaciers merge forming the Skoga River and ultimately cascade down this massive cliff creating a breathtaking display of power and force. If you’re ready for some exercise, take the staircase up to the top for vast views of the valley and beyond to the ocean. Then explore the base and get as close as you dare. Of course, the closer you get, the wetter you’ll become. If you don’t see a rainbow when you first arrive, just wait! One will be coming! When we first arrived, what caught our immediate attention were the powerful waves crashing on the black sand beach. This is not something you see every day. We read signs to be careful about “sneaker waves” and even read a few stories about unfortunate travelers who were caught unaware and lost their lives. The signs advise everyone to keep their eyes on the water and not turn your back in case one of these ominous waves approaches. 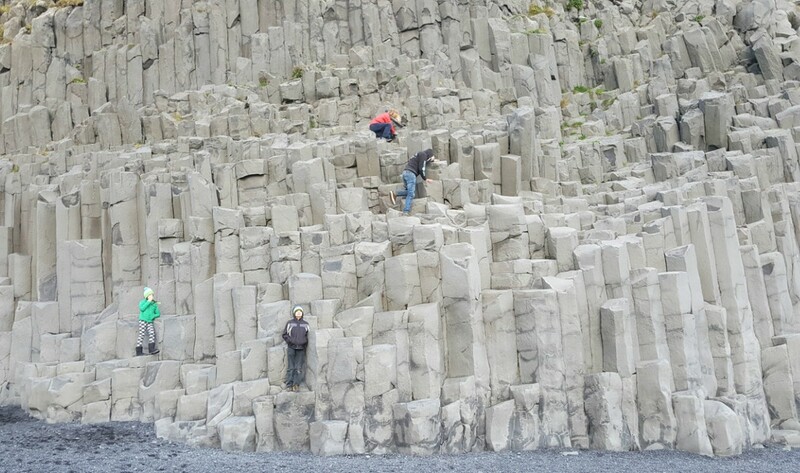 For our boys, the big highlight here was climbing on the hardened volcanic columns that are present along the hillside facing the beach. Quite a unique site, reminding us a bit of Devil’s Postpile National Monument in California, these columns were formed when a lava flow cooled and then cracked into these block-shaped spires. 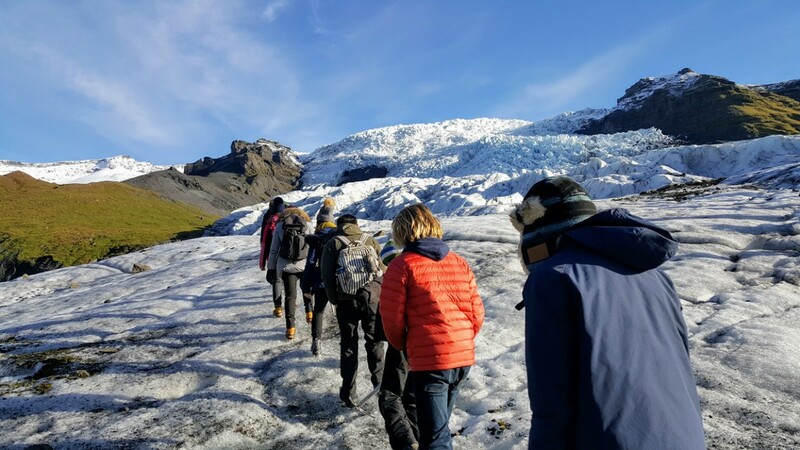 When working out the details of our trip to Iceland, we planned to do some things on our own and other activities with a tour company. Hiking on a glacier was one of these things that fit into the second category. We chose Glacier Guides and were happy with this group. They are located in the Skaftafell area and operate out of a parking lot near the Skaftafell visitor’s center. They offer a variety of hikes of different lengths and level. We chose one that was suitable for families and lasted about 3.5 hours. First, we got outfitted in our crampons and ice picks; then we took a 15-minute bus ride to the base. 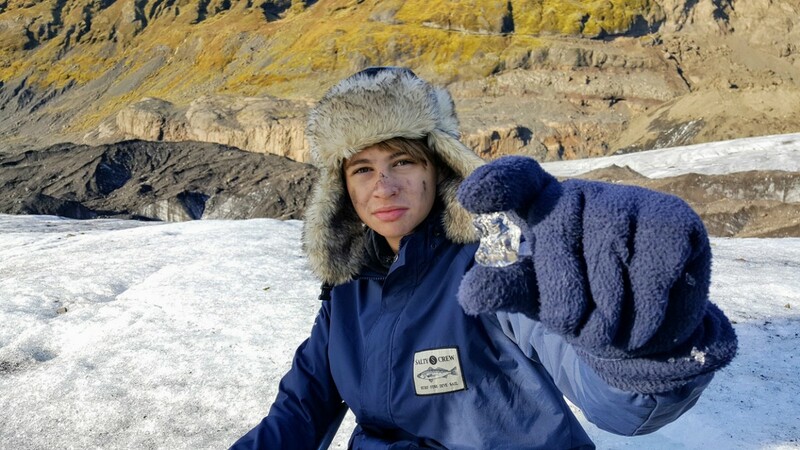 We walked up the Falljökull glacier tongue, and yes, those crampons work! The tour was educational and provided incredible views. I think the only disappointment was for our teens who were expecting more adventure. 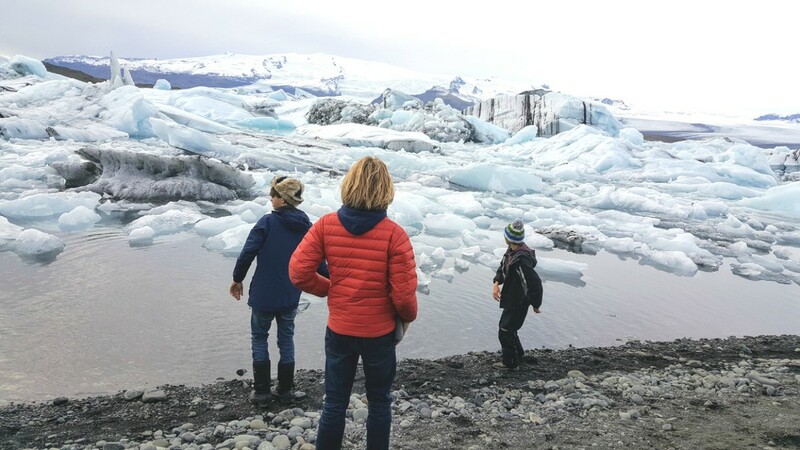 This was a glacier WALK and didn’t quite satisfy the appetite for a daring escapade. This was probably one of the most unique places we have ever been. 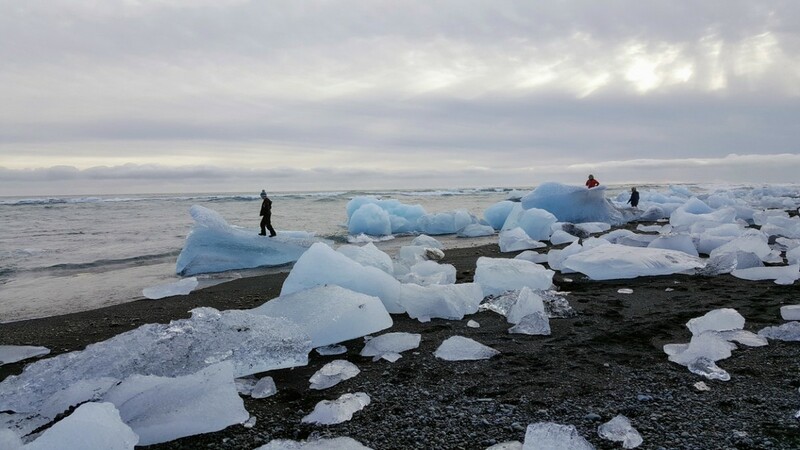 For starters, we have never had the chance to climb on top of icebergs and explore a beach littered with them. Then, the fact that the beach was a black sand beach made it even more unusual. The contrast between black and white was stunning. 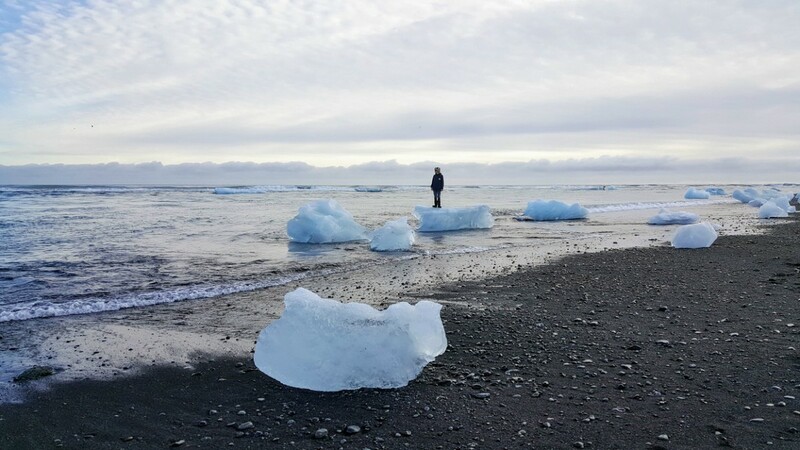 The ice comes off the Vatnajökull glacier and breaks up into small pieces as it floats into the Jökulsárlón Lagoon and then out to the ocean. This beach is called Diamond Beach and is just off the ring road. 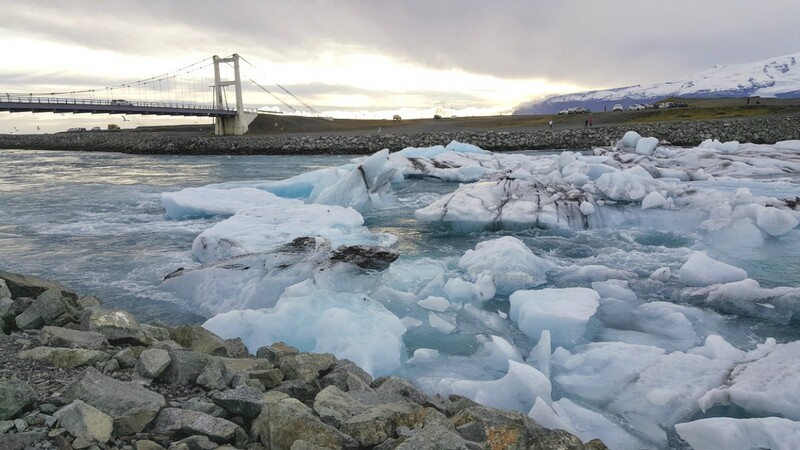 There are a couple of boat companies that will take you out on the lagoon for an up-close view of these majestic pieces of ice and rock. 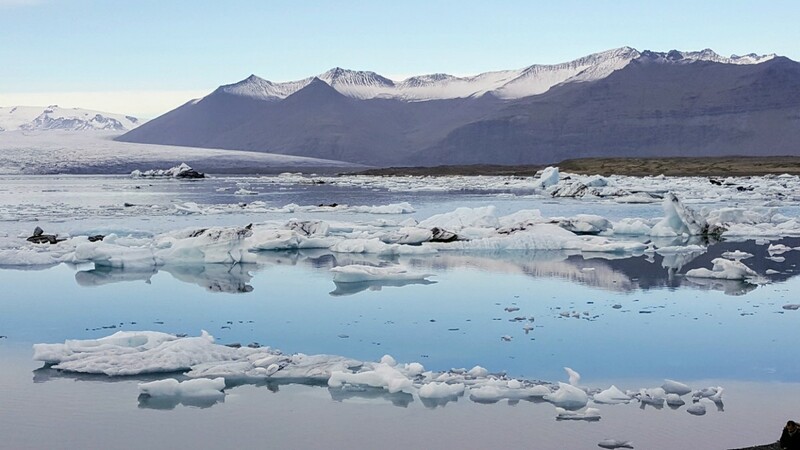 How long does it take to visit the Southern Region of Iceland? Well, that’s a good question that doesn’t have a simple answer. We allocated two days to explore South Iceland, and we were able to see MOST of what we wanted to see. If we had more time, we would have slowed our pace and added a few more sites. 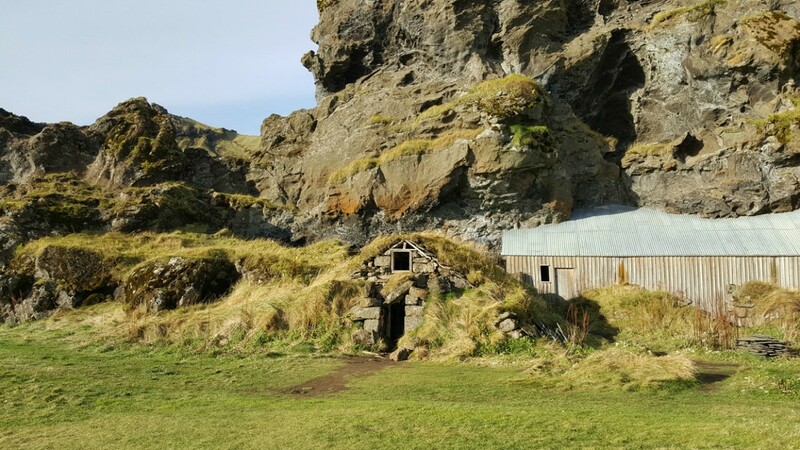 A place in South Iceland that I wanted to visit was Vestmannaeyjar (also known as the Western Islands), but we just couldn’t squeeze it in. With ferry crossings only available two times a day in October and considering that the famed puffins had already left their nests, it didn’t make sense to go. But on some future trip, I’d love to visit there. Jökulsárlón Lagoon was our furthest point from Reykjavik and to give you some sense of distance by car; it would have taken us about 6 hours if driven all at once without stops. 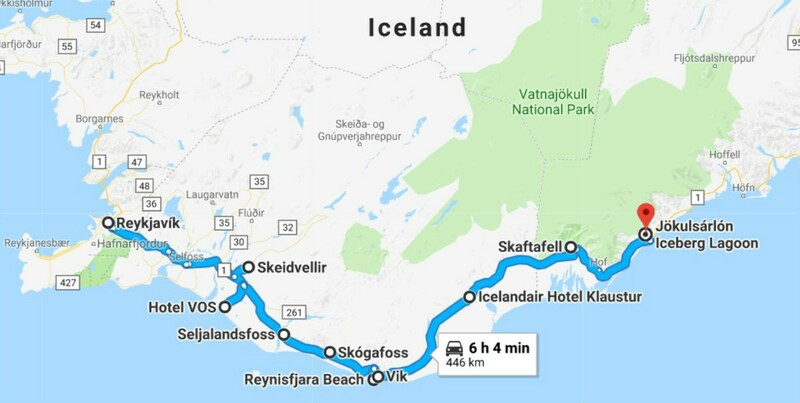 We chose to sleep in two different spots in South Iceland which allowed us to cover some distance each day without spending too much time in the car. (Both of these are shown on the map as well). This was an excellent place to spend the night and enjoy a delicious home-cooked lamb dinner. Hotel Vos is tucked away from the city lights, and so it was a great place to see the Northern Lights! We loved the modern, almost IKEA feeling, family-room that accommodated all five of us comfortably. The hot tub located outside under the stars was a pleasant place to end our long day of sightseeing. Breakfast is also included in the room rate. If you choose to dine in their small restaurant for dinner, be sure and let them know ahead of time as dinner is only served with a reservation. This Icelandic chain hotel was better than expected. Although the rooms felt a little dated, and tour buses lined the parking lot, we were pleased with the friendly staff and comfortable, clean guest rooms. We also ate dinner and breakfast here and enjoyed it very much. Next door is an indoor/outdoor water recreation facility with numerous pools and a water slide. Our boys thought this was a great place to spend a few hours after dinner and before bed. 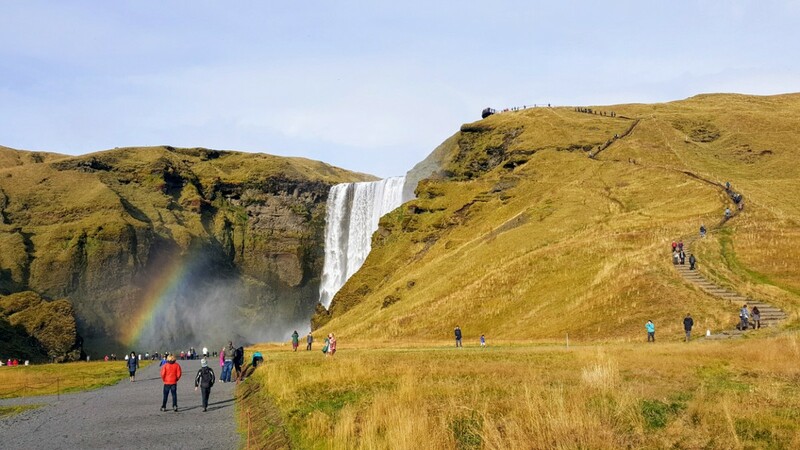 If you’re looking for a place to purchase Icelandic souvenirs such as knitted sweaters and hats, Viking stuff, or need cold weather or outdoor gear, then you might want to check out Vikurprjon Wool Factory in Vik. They also have a café and bathrooms. We stopped in at this little local restaurant of a gem in Selfoss one night and were so glad we did. Inside an old house, with delicious pizzas, soups, fish and chips, a great wine list and freshly baked cakes, every palette in our group was happy! Have you been to Iceland? What did we miss? What should we see next time?